After settling in Toronto following my Montreal trip, I decided that vegetables needed to be heavily integrated back into my diet (there is nothing green about smoked meat, poutine, and croissants). At the same time, I was still getting over my annual summer cold – and was craving something hot. Luckily for me, there were tomatoes on my counter and basil in my fridge! 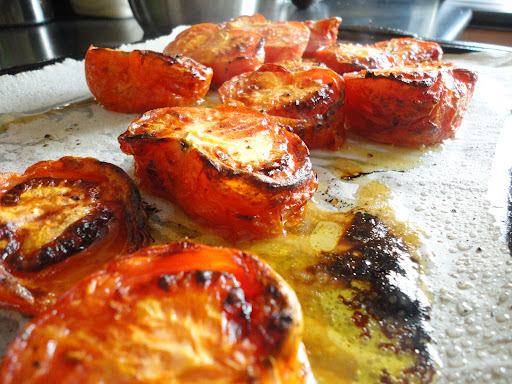 After the oven tomatoes are done, heat up a pot and add some olive oil to the bottom (about 2 tbsp). Add in the garlic, onions, and red pepper flakes, and mix until the onions are translucent. 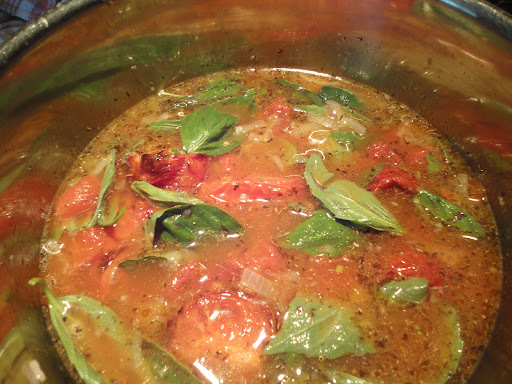 Add the diced tomatoes (including the liquid), basil, thyme, oven tomatoes, and vegetable stock. Simmer on medium-head for about 30-40 minutes. After the soup has simmered for 30-40 minutes, turn off the heat and use an immersion blender (or food processor – just let the soup cool down) and blend components until everything is nice and smooth (for the most part). 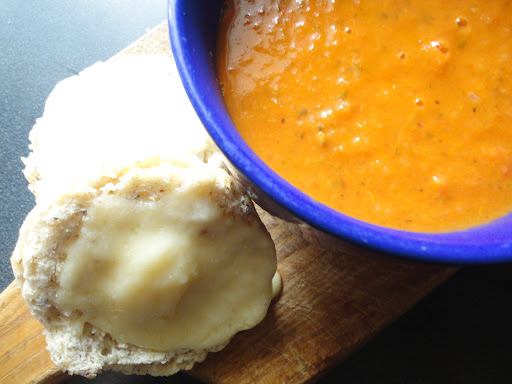 I prepared a delicious cheese ‘sandwich’ to go with the soup (mainly just to dip)! What’s your go-to meal when you’re sick, or just craving more vegetables?